car journey | "Keep Running Mummy!" In the past week, due to a toddler with a sickness bug, a husband who’s had to work late and a baby who insists on feeding all evening, I’ve only managed to head out for one run. It’s made me realise what a mammoth task training for a marathon while caring for a very young family is going to be. Still, one thing consoles me. However tough it’s going to be, it won’t be nearly as hard as my almost daily task of trying to make the 5ft journey from the house to the car with said young family. Unfamiliar with having to get out the door with an entourage of mini people? Here’s how it works. 10am: Inform toddler that it will be time to leave the house in five minutes. Ask toddler if he needs a wee. 10.01am: Watch as toddler breaks down into tantrum of epic proportions, because he does not want to leave the house. Ever, Mummy. 10.05am: Try to placate toddler by telling him we’re going to the park and he will have fun. 10.06am: Dodge the Lego train the toddler hurls. 10.07am: Sit down with flailing toddler and explain we don’t throw things in this house. 10.10am: Bribe toddler with a cookie. 10.11am: Wonder why I didn’t bribe toddler with a cookie ten minutes ago. 10.12am: Find toddler’s shoes. Ask toddler if he needs a wee. 10.13am: Baby starts crying. Realise it would be wise to feed her, to avoid the car journey from hell. 10.14am: Feed baby. Toddler asks to watch Peppa Pig. Tell him he can watch just one episode. 10.29am: Three episodes of Peppa Pig later, everyone is ready. 10.30am: Turn Peppa Pig off. Give toddler another cookie. Get toddler’s shoes on. Ask toddler if he needs a wee. 10.32am: Hear the baby fill her nappy. Head upstairs to change nappy. 10.33am: Realise it’s explosive. Change baby’s entire outfit. 10.42am: Get back downstairs with baby. Spy toddler’s shoes at the bottom of stairs. Toddler has vanished. 10.43am: Locate toddler. Ask him if he needs a wee. 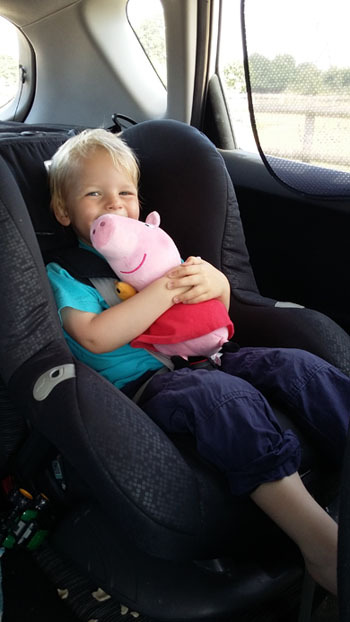 10.45am: Get both baby and toddler in their car seats. Get in the car. Start the engine. Toddler announces he needs a wee. 10.46am: Turn off engine. Race out of car with toddler and back into the house. Locate potty. Sit toddler on potty. Console myself that at least that distant crying I can hear isn’t my child. 10.47am: Realise that distant crying I can hear is my child. It’s my other child. The one who is now outraged at having been left in the car. 10.48am: Get toddler back in his car seat. Get back in car. Toddler announces he needs his tractor. NOW Mummy! 10.49am: Slowly lower head to the steering wheel and silently weep for those bygone days when all I had to do was grab my keys, grab my bag and then LEAVE THE F*CKING HOUSE. 10.50am: Go back inside. Locate tractor. 10.51am: It’s the wrong tractor. 10.52am: Lose the will to live. 10.53am: Go back inside. Locate every tractor the toddler owns. 10.56am: Present toddler with eight tractors. 10.57am: Get back in car. Turn the engine on. Reverse out of driveway. 10.58am: Congratulate self on leaving the house in less than one hour. 11.01am: Realise I’ve forgotten the changing bag. Turn car around. Yes. Running a marathon will definitely be easier than this. Getting a toddler into a car seat: harder than running 26.2 miles. This entry was posted in Motherhood and tagged baby, car journey, marathon, motherhood, parenthood, toddler, travel on June 25, 2015 by Claire.